It seems like so many people want to do something to help the people who have become victims of the current hurricanes and earthquakes, but how many people really do that, is not what usually happens. There are many, many who do help out, but so much more is needed to help so many. The Northwest Volleyball team and coaches are a group that decided to jump in and do something about it, not just talk about it. 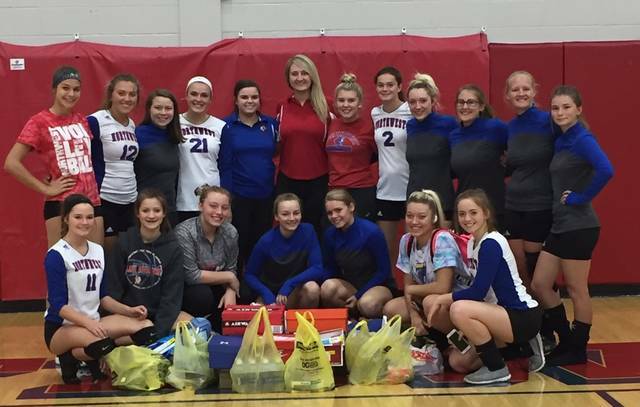 The Northwest Girls Varsity and Junior Varsity volleyball teams all came together on Saturday, September 30, 2017, to make care packages for the victims of Hurricane Maria in Puerto Rico. Head Coach,Taylor Cantrell, along with assistant and JV coach, Alyssa Sparks, put their heads together and thought it would be a good idea for the girls to do something for the victims of one of the recent hurricanes. Once they got a time to set everything up, it was apparent to the coaches that the victims of Maria in Puerto Rico, was having a lot of trouble getting resources and needed things the most. They told the girls that they were going to do care packages for the victims of the hurricanes and/or natural disasters that had occurred lately. “We finally got them together and were going to send them to Puerto Rico, because they were having so much trouble,” said Cantrell. On Saturday, after their tri-match with East and Manchester, where Northwest won both, all the girls and the parents, brought in bags of things, shoeboxes, and then the coaches have bigger boxes to put things in them. They were supposed to do it on Friday, but some of the girls forgot their items, so they planned it for after their matches on Saturday. Cantrell said that some girls brought in clothes, even bras, a lot brought in canned food, and then there were the house-hold items, like toothbrushes, body wash, shampoo, some brought candy, just a bunch of different things to put in the boxes. She also said she found some cards in some of them, from the different girls. Some of the girls and parents, made multiple boxes, while others just brought in bags of things, which the coaches will put in the larger boxes to be sent to Puerto Rico. Cantrell said, ” A lot of the girls thought it was a good idea to help out, even the parents liked it too.” She wasn’t sure at the time, how they were going to send them, but was going to try to put all in one big box, so it would all be together. Cantrell has eight girls on the Varsity team, but also brings up about five of the JV girls, who also sit Varsity. And some of the girls spoke on what it meant to them to put themselves in the background and put others and their troubles first. It sounds like Emmons is stepping up and putting out a challenge for other teams around. What a great way to bring teams together and spark up even more help for others!